Past Preservers is proud to announce the latest addition to our team of presenters: John Ward and Dr. Maria Nilsson, the intrepid duo who have dedicated the past several years to uncovering the secrets of one of the biggest archaeological sites on the Nile! Having known her goal in life since childhood, Swedish Archaeologist & Egyptologist Dr. Maria Nilsson is a researcher by heart: she lives & breathes archaeology & research & she is truly passionate about her work, her team & her family. Maria shares her life’s passion with her husband & research partner, John Ward, who live with their family in Sweden & Egypt. Maria has made numerous appearances on international TV, radio & print media to spread the word about their team’s many exciting finds at Gebel el-Silsila, where she currently serves as Mission Director. Maria has also been a National Geographic Explorer since 2015 & an Explorers Club Fellow since 2018. 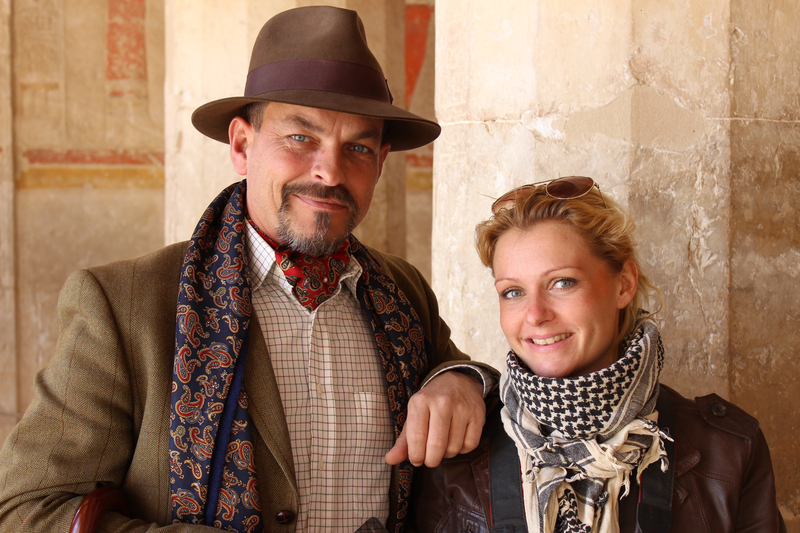 John Ward is a British archaeologist with over a decade’s experience living & working in Egypt with his wife, Swedish archaeologist Dr. Maria Nilsson. Since 2012, John has served as Assistant Director of the extensive archaeological dig site of Gebel el-Silsila. John is a familiar face in the world of media, having recently appeared with Maria on National Geographic’s “Egypt’s Treasure Guardians” as well as the Travel Channel’s “Expedition Unknown” & the Science Channel’s “Unearthed”. John is also a National Geographic Explorer & an Explorers Club Fellow. John & Maria are currently carrying out archaeological works at the vast New Kingdom necropolis of Gebel el-Silsila, south of Luxor on the River Nile, which includes fascinating historical sites such as a large family cemetery & the recently rediscovered Temple of Kheny. They started the Gebel el Silsila Project in 2012, the only Swedish-led archaeological mission in Egypt, spanning over 30 square km2 & 10,000 years of human activity & involving a team of more than 100 people. John & Maria are the founding trustees for the Friends of Silsila, a charitable organization that aims to continue to support & fund archaeological expeditions to this historical site. John are Maria are joining a team of presenters that make up Past Preservers People, a boutique, full service talent management agency which represents experts in their fields from around the globe. The company is built around a small but diverse group of individuals that share the passion and drive necessary for success in the highly competitive media world.